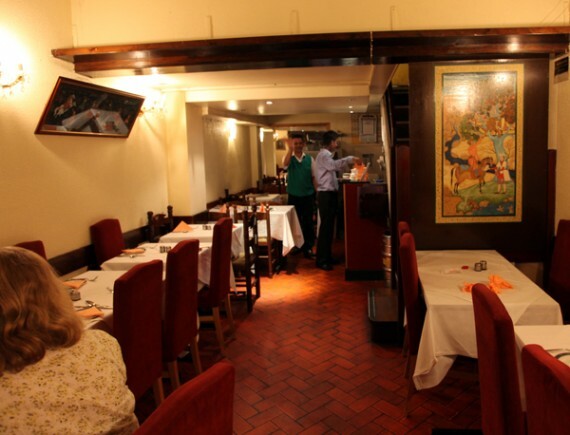 What makes Victoria Tandoori different, though, is that they openly acknowledge catering to allergy requirements on their menu, and can provide dairy-free versions of pretty much any vegetarian dish, including all the usual curry favourites. 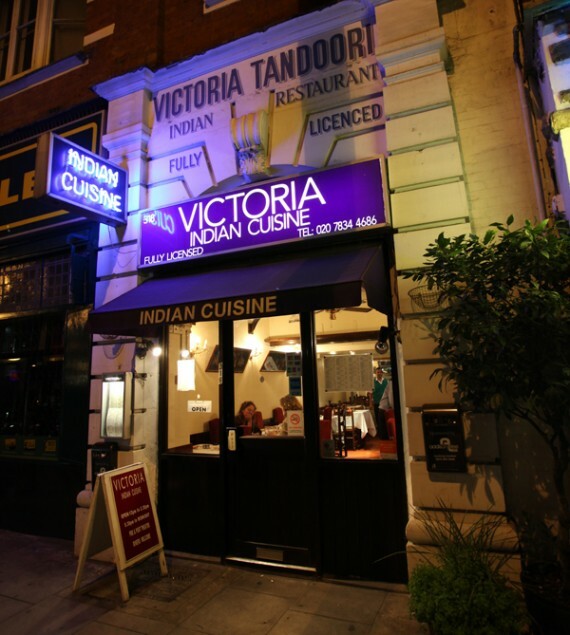 Not only is Victoria Tandoori very vegan-friendly, but they’re also as traditional as an Indian restaurant can be – especially in Central London (the name Victoria Tandoori is because it’s across the road from Victoria Station, London’s busiest railway interchange). The restaurant is tiny with seating for only 18, and even then they have to pull your table away from the wall so you can squeeze in. Americans would call this a “hole in the wall”, a most accurate description. Victoria Tandoori is small, hot, cramped and looks out over a very busy bus station. There’s flock wallpaper and the toilets are above the dining area through a strange maze of creaky staircases and unfathomable door locking devices. Be prepared not for the finest dining, but for great food, served by honest people at good value in a super-convenient location. On our recent visit, we started off with a couple of poppadums, which are crispy crackers fried in oil. We piled on the cucumber and coriander salad, mango chutney and lime pickle (a wonderful combination) before our main dishes arrived. 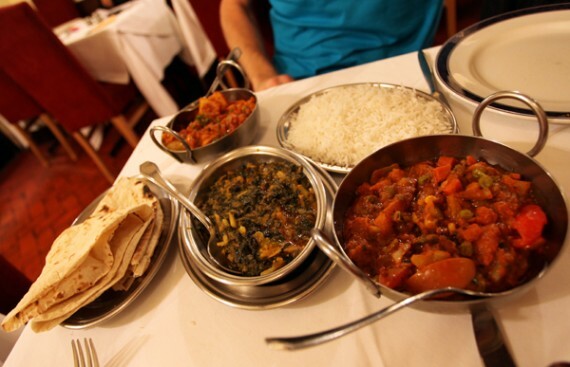 Following the advice of our waiter (who consulted with the kitchen to make sure what we got was vegan) we ordered an Aloo Gobi, Vegetable Balti and Saag Bhaji along with some steamed rice. I usually ask for my meal extra hot, and I wasn’t disappointed. The Aloo Gobi came with a fiery hot chili tomato sauce and lots of firm potato (aloo) and cauliflower (gobi) as well as whole tomato wedges, coriander and mixed vegetables. Every bit as amazing as non-vegan curry, Victoria Tandoori does a great job of making a staple dish like this extremely tasty. 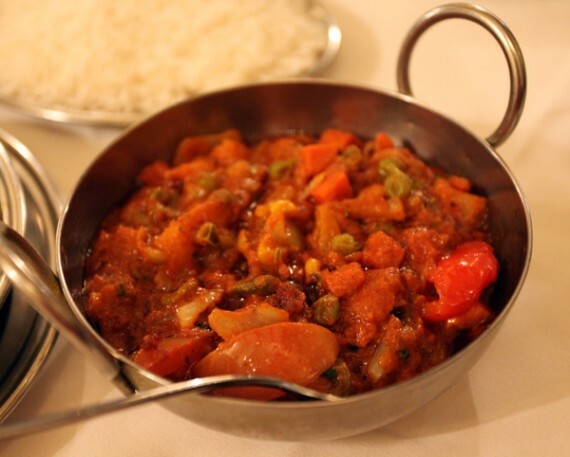 The Vegetable Balti was also out of this world: A huge serving of mixed vegetables in a dark and spicy curry sauce with chunks of potato. Simply scrumptious! 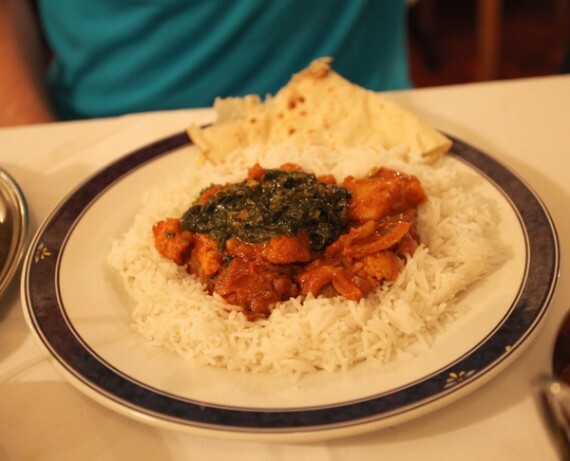 Our final dish, Saag Bhagi, was supposed to be a side order, but ended up being every bit as large as the other dishes. 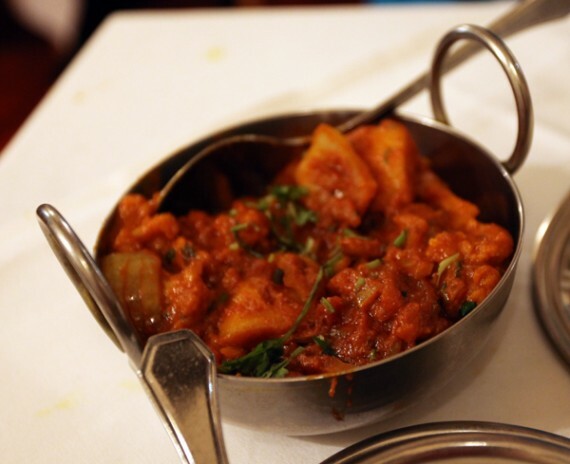 With Indian food, a Bhagi is usually a saucy dish with beans or mashed vegetables. 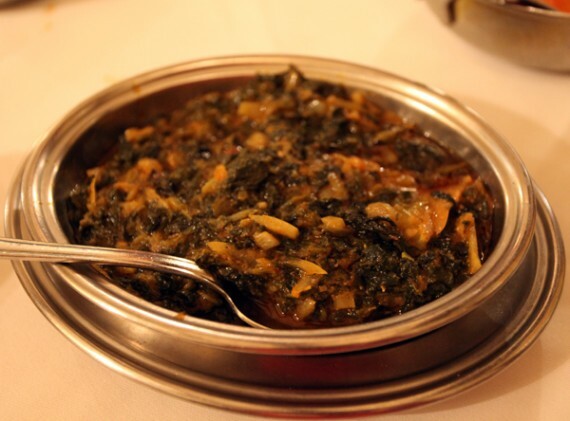 The delicate spices, simmered along with the sauce and vegetables give a complex aroma and taste that’s unheard of in any other cuisine, and make Saag (spinach) Bhagi a superb accompaniment to more aggressive, and hotter, Indian food. We rounded everything off with an order of chapati and steamed basmati rice, which arrived with just a little seasoning and some fresh coriander and cumin mixed in. I know that getting to Victoria from Heathrow is quite an ordeal, especially as it will add on at least six hours to your western journey back to the good old U S of A, but if you want a vegan British-Indian curry in a traditional London Indian restaurant you won’t find anywhere better than Victoria Tandoori. Heck, if you live in London or are visiting then you have no excuse. Please drop in and ask about their non-dairy options. You’ll be in good hands, will get a great meal to fill you up wether you’re riding two stops on the Circle Line to Sloane Square or heading 5,500 miles to Los Angeles. I’ve never seen an aloo gobi that red before. Perhaps you have not had a “real” one in the UK? This was very much like a vindaloo, with a really tomatoey sauce. After further review, I think the white balance was a little off on that pic! I don’t recall it being quite so very red.